I feel like I have seen them all, and experienced passing through or over most varieties. The high gate. The low gate. Those edged with barbed wire, usually rusty and not sufficiently taut. Those with mesh that allows for a foot insert. Those with mesh that won’t support a foot. Wrought iron gates with verticals allowing no foothold. Those which move on their hinges and sway dangerously in unexpected ways mid-climb-over, and always when your balance is weak. Plus combinations of the above. I prefer the gates which do not have a padlock, or loops of intertwining wires which has been hand-twisted by a strong armed farmer into undoable knots, or any other permanent restraining device – I have seen a few ingenious specimens. The gates without these impediments do not need to be scaled, can be opened, passed through and then closed again. 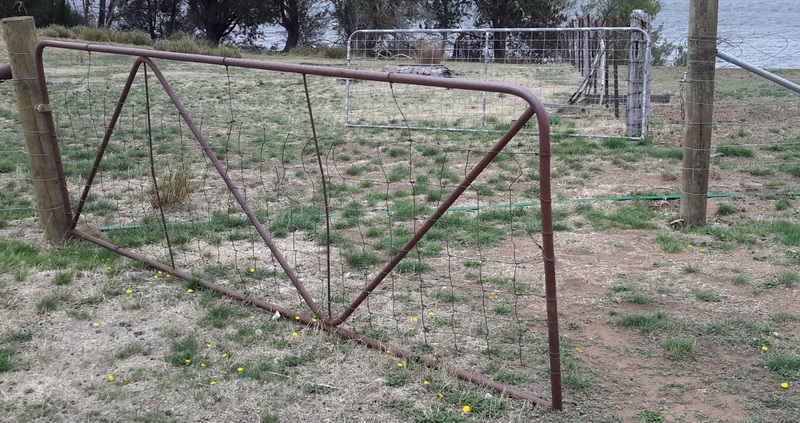 Sometimes with difficulty as I have had to strain to make gates reconnect with the fence again and then complete the ‘locking’ device. Sometimes I need the force of my whole body against the fence upright to pull the gate close enough to get the chain or whatever over and in place. Nevertheless this process seems more civilised than clambering over gates. When a gate defeats me I least prefer having to walk up or down a long fence line that is unclimbable (ie the mesh, barbed wire and electric wires combination do not give me effective toe-holds) – and the paddocks are always huge – until I find a way to squeeze beneath the fence where animals might have made a pathway, there is a tree branch over a fence which I can use to help me cross, or by a stroke of luck there is a weakness in the wires or a wire is missing. 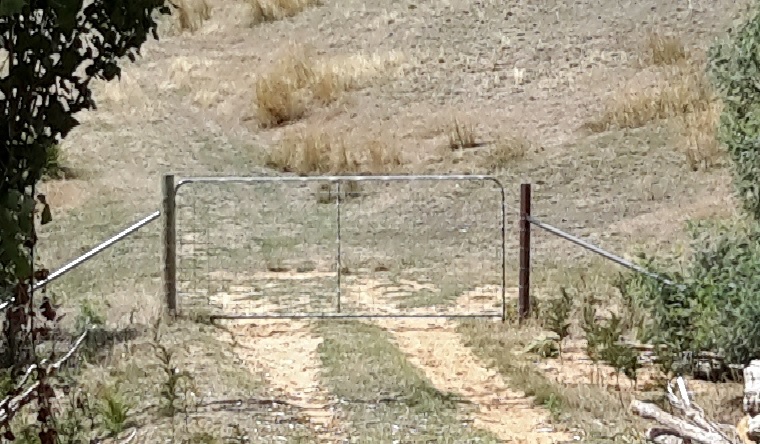 On the farming properties in the area between Gretna and Lake Repulse Dam, there have been many gates to negotiate, some of which I have described in earlier posts. The preferred gates look like the ones below because they can be opened and closed with no problems, or easily stepped around. The best gates of all are those that are open already. 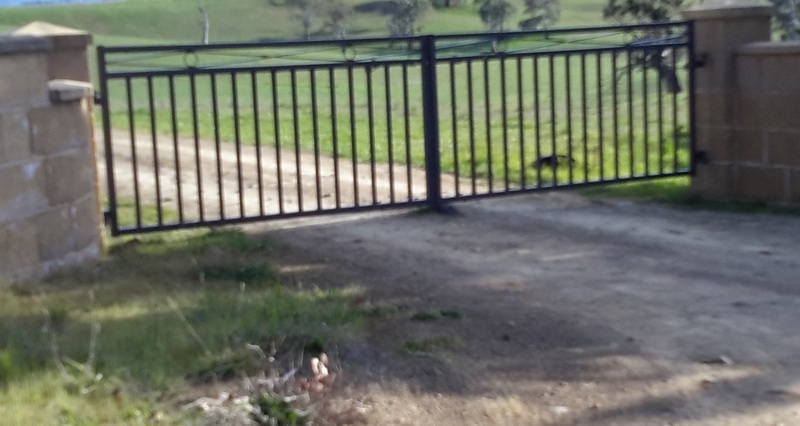 Thank you Felicity for driving me through some gates kindly left open by the property owner so that I did not have to retrace my steps for part of one of my walks. 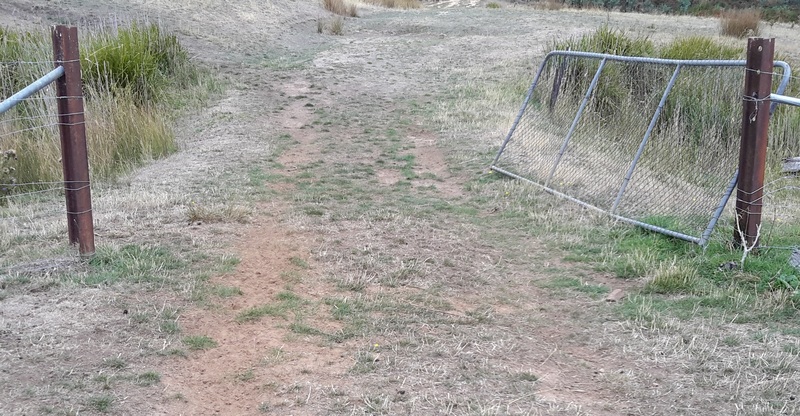 The least preferred gate situation is the one pictured below. In this case, those waiting behind the gate were the deterrent. 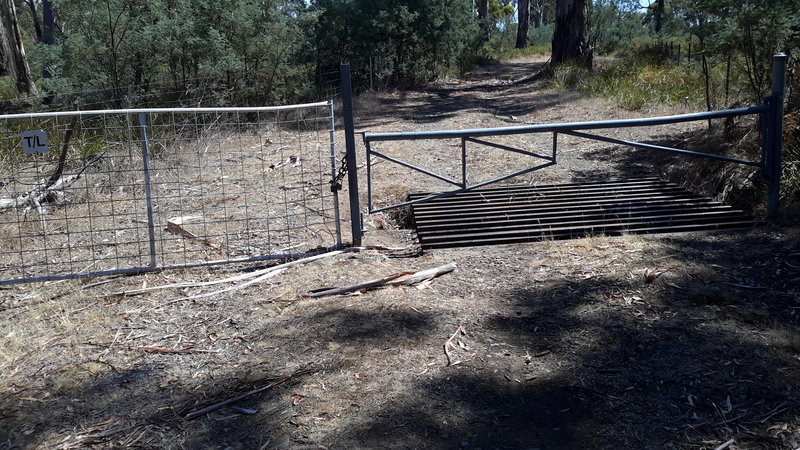 This entry was posted in Derwent River, Tasmania, Walking and tagged gates on March 22, 2016 by Tasmanian traveller. I love this kind of posts – presenting one theme with different types. Thank You. I am glad you enjoyed this post. Your comment makes me realise I could repeat this idea with other subjects. Thanks.